Cut the flank steak against the grain into slices of about 1/4-inch thick, or as thin as you can. One by one, place the slices between two sheets of parchment or wax paper. Use a meat pounder to pound them very thin, less than 1/8-inch, or until you start to see the bottom sheet of paper through the meat (but not so thin that it is completely breaking apart). As you move along, place the pounded slices on a cooling rack set on top of a large sheet pan or chopping board. Once done, sprinkle 1 1/2 teaspoons salt on one side. Flip over and sprinkle with remaining 1 1/2 teaspoons salt. When ready, pre-heat a grill or grill pan over medium-high heat. Once hot, brush the meat with vegetable oil and cook in batches for 1 to 2 minutes per side. Rest under aluminum foil until ready to use. 🌺🌹🌹. Even the desert looks muy. delicioso- !!!! Oh I hope you love the sandwich, Rose! I love your show and all the Mexican culture you bring out. Your so passionate about you love for Mexico. I love it. Thank you! Q. What does tasajo mean ? Oh one more where can I find avocado leaves? You used them in a salsa recipe. I would like to try using avocado leaves too. Tasajo is a word used to mean “a piece of meat” and that is just the name that has been given to meat that is prepared this way, thinly sliced and salted. You can find avocado leaves either online or your local Latin Market. Have fun cooking! 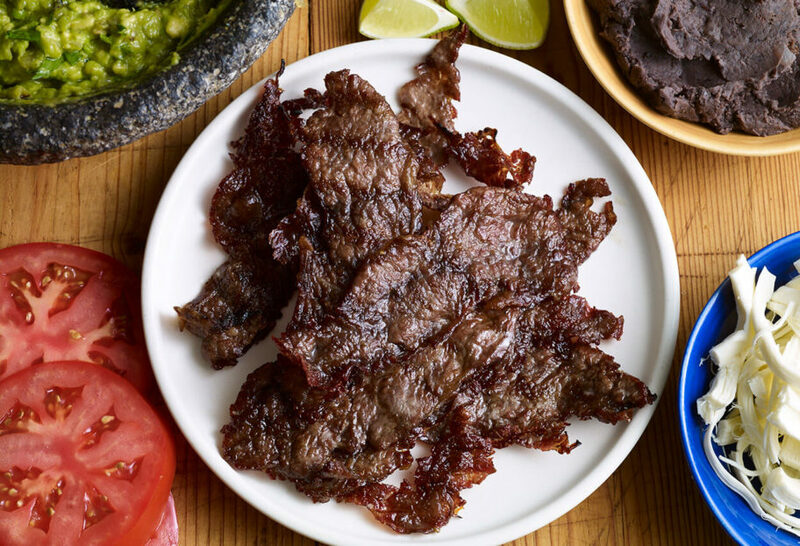 Can I use skirt steak as a substitute? Luv this Site! Great infro! Hola Pati, Feliz Año Nuevo! I watch your show with my soon to be 5 year old son. We just watched the episode where you make the Tasajo and Natilla and he asked me to make it for him, he is such a fan of yours. Love watching the show with him because he learns about my culture and gets to see how beautiful Mexico is. Saludos! Oh wow thank you so much Nancy! Please say hola to your son for me!!! Wishing you and your son a wonderful 2018. Pati, I wanted to thank you for you segment of Tasajo. I am American along with my wife . We absolutely love Mexican qusine . I love watching your shows with my special wife . We love cooking together.You are program to record each episode . You have passion for your culture. The Tasajo technique of pounding the meat is fantastic . I smoked it on my charcoal grill. Because I didn’t have a pan grill skillet . It was so so tender . I made the whole meal . I love to cook. The Natilla was so good. I call it ……..a pillow of cloud heaven. From my wife and I we thank you. Thank you so much Hans and Donna! I’m so glad you enjoyed the whole meal! What about the safety of leaving the meat out for 3+ hours? And is there a difference in the result if you use the fridge after 2 hours? ​I leave it out for more than a few hours, but you can definitely leave it out for 2 hours and then bring in the fridge. It will be just as awesome. Pati, you’re dishes and show are marvelous! I’m Mexican and my mother made the best meals growing up that literally took days to prepare. I’m so happy that you have made them achievable for this busy mom. I’m making these delicious tortas I saw on your show this weekend! Thanks again! This made my day…thank you so much Queli! Wow. We just watched this episode. That torta looks so good. So very very good. Did you use 1.5 teaspoons of salt on each side of the whole batch of beef – total 3 tsps or was this amount of salt per each strip of beef. Maybe this is the similar to the dried beef as grandma used. Someday I will give this recipe for tasajo a try. The photo of the torta was so GREAT I sent the URL of the torta webpage to friend that likes good food. Your grandmother’s dish sounds so interesting…I hope you enjoy this as well! I use 1.5 tsp on each side for the entire batch. Like a fast beef jerky! Can’t wait to try this out on my Mexico City native hubby !! Oh I hope he likes it :). Such a delicious and simple use of a good piece of beef. Thank you for sharing this wonderful recipe. Thank YOU Gabrielle for trying the recipe!